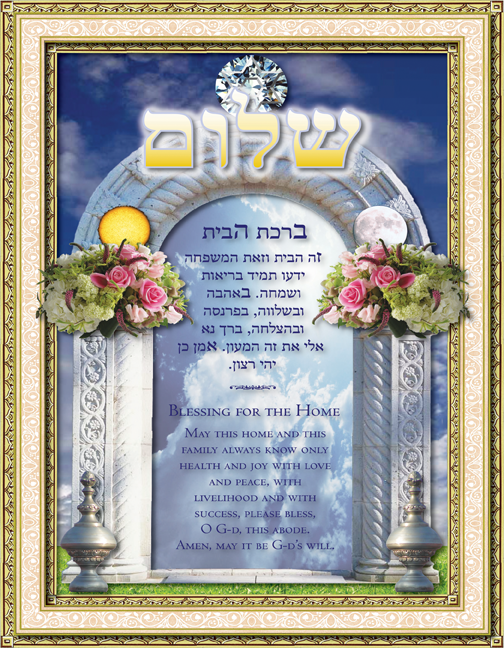 Home Blessing :: "Gates of Joy"
The “Gates of Joy” Home Blessing depicts an entry into a new life within a happy, healthy home filled with peace. The intricately carved gateway suspends beautiful rose-filled floral bouquets that beckon us to venture forward. 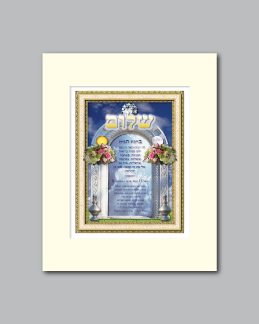 Above the gate is the Hebrew word “shalom” meaning “peace”. The sun and moon rise from the bouquets to remind the us of the days and nights we will spend together in this home of peace and love. 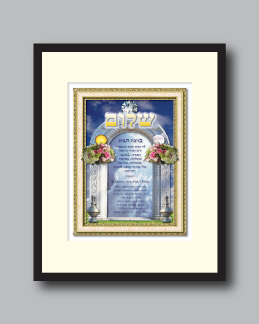 This word, along with the spirit of Hashem, (as depicted by the round diamond with Mogen David), crowns the gateway as a portal for this home to receive “health and joy with love and peace, with livelihood and with success”.